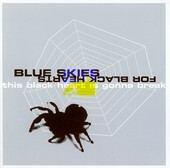 Lo-fi singer songwriter tunes meets dangling indie-rock hanging by a guitar string, Portland, Oregon's Blue Skies for Black Hearts' debut, This Black Heart Is Gonna Break is a solid offering from the mastermind behind the band, Patrick Kearns. Recorded and engineered at his own studio, Studio 13, the record revolves around its darker imagery courtesy of the lyrics. Though it isn't all doom and gloom, and the music's rough, loose feel offers a completely different contrast, giving the album a friendly vibe, as if Kearns and the band were up late at night at your house, picking up their instruments, and playing you some of their new songs. And that is what makes the album. The fact it sounds like some friends playing you their new demos for the first time, the excitement of exposing the songs to you, flaws and all, and allowing you to react as you offer your advice and input on where the band should take the songs. I'll give it a B.